As a patient battling sarcoidosis and/or pulmonary hypertension, you already know the frustration of limited treatment options. The Foundation of Sarcoidosis Research is by your side in this fight, dedicated to providing resources to patients as well as working with partners to accelerate research. One of our roles is to help patients understand what they can do to assist in the progress of research, including letting you know about any studies or trials that may be applicable for you. One such trial is occurring at numerous sites around the nation, and may be of interest to you. The trial focuses on patients with Pulmonary Hypertension with multifactorial mechanisms (including sarcoidosis). This is a placebo-controlled, multi-center Phase 2 study of bardoxolone methyl in PAH. Below is a list of the sites and contact information from who are recruiting – we encourage you to review and contact the research coordinator at the site that might be of interest to you. Please remember that these trails have very specific qualifications for engagement, so it is important that you contact them directly to get information and assessment of your eligibility. If the interested patient qualifies for the study, travel and other expenses will be covered by the study sponsor. 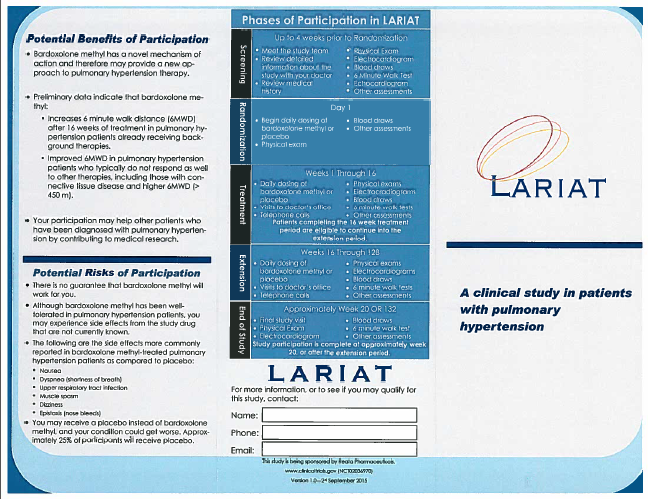 Click image for full brochure detailing benefits, risks, and qualifications of the study. We hope you will explore this opportunity to engage in advancing research! FSR provides this information solely as a resource for your knowledge and exploration. Trial recruitment is extremely important for research to move forward. Thank you and best wishes for stronger health!